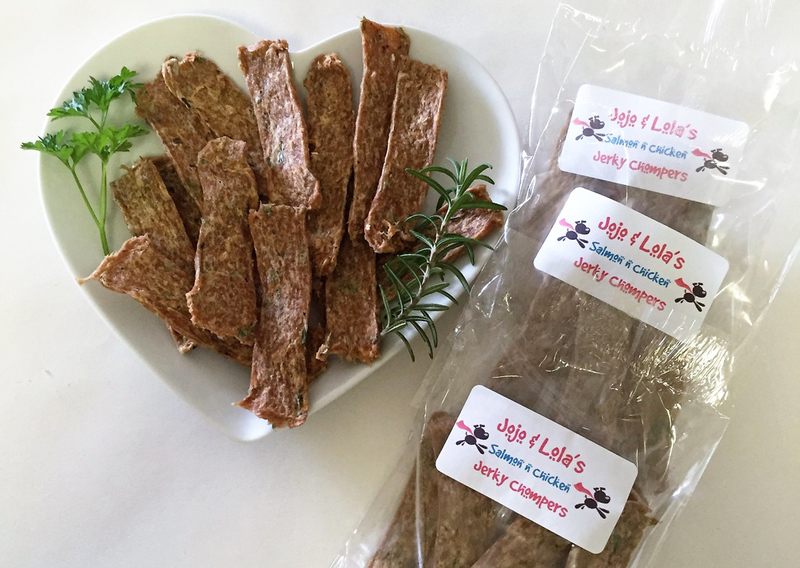 Jojo & Lola's Jerky Chompers are a home-based business making healthy and tasty gourmet jerky treats from fresh human-grade ingredients for dogs and cats. 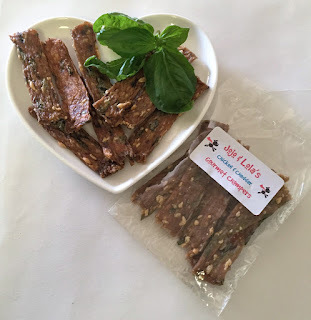 The idea for the Jerky Chompers business started after furmum Susan started making treats for Jojo and Lola - the official doggy taste tasters - as an alternative to store bought treats. They loved their Chompers so much (and so did their friends) that she decided to start making them commercially and she opened her own market stall in May 2015. All Gourmet Chompers contain 100% human-grade ingredients and fresh herbs (rosemary and parsley) from the garden. There are no added flavors, colours, preservatives, sugar or salt. The chicken and fish-based Chompers shrink the least and are quite a crispy treat, while the fattier meat flavors tend to shrink more but are denser in texture and weight. As each Chomper is individually handmade in small batches, there may be variations in colour, dimensions and texture between deliveries. Chompers also vary in size and texture between flavours, and each flavour will dry differently according to fat content and various external factors such as humidity. Jojo & Lola Jerky Chompers - "Salmon and Chicken"
There is also a special "Gourmet Chomper of the Month" and June is Chicken & Cheddar month! If you have any concerns about possible food allergies, the full list of ingredients used for each flavour appears in the product description . As they contain no preservatives, your chomper treats are best consumed fresh (your dogs will more than happy to help!) however they will last many weeks in the refrigerator. If you live in Brisbane, you can find them at one of the regular markets on the North side, including Carseldine Markets, Mitchie Makers Markets and the Nundah Farmers Markets. 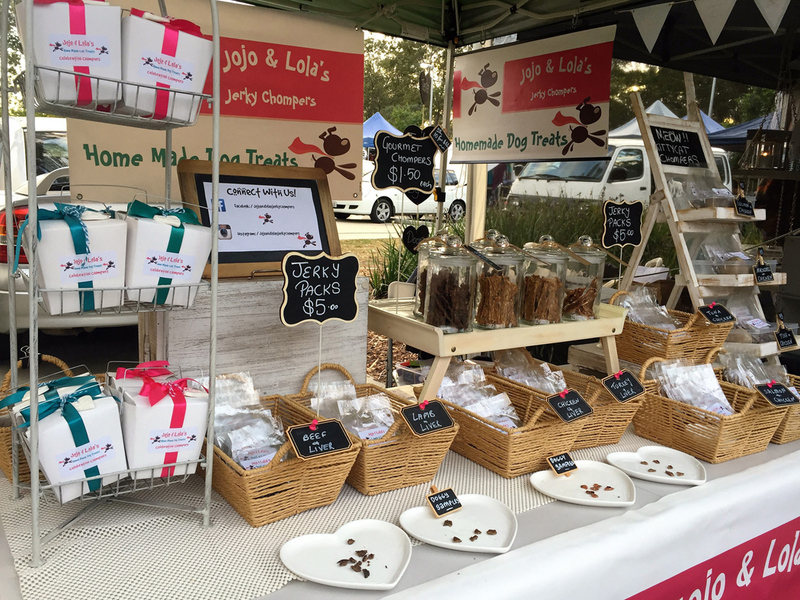 Jerky Chompers can also be purchased from Puppy Shack (Grange) and The Pooch Palace (Strathpine). The KittyCat Chompers are available at the Lucky Cat Cafe in Annerley. Jojo & Lola's recently opened their online shop and can now deliver anywhere in Australia. 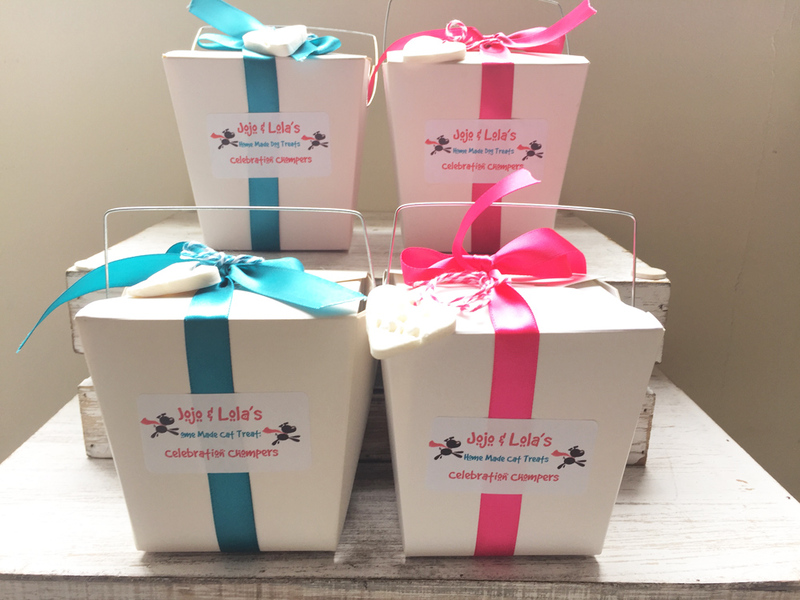 Why not add a Gift Box for a special occasion for only an extra $4!